One of the great things about being vegan, at least for me, is a marked reduction in getting sick. Since I became vegan (around 2001), I had never caught a cold or - until now - a flu. Perhaps from one of the classes that I teach where there was a sick student, I seem to have caught something that has me tired, sleeping about 12 hours a day (!) and with a minimal appetite for anything more than maybe soup and toast or mashed potatoes. I first felt a sore throat on Sunday the 20th (my last blog posting), which largely went away in a day or so, but the fatigue and other symptoms are still with me. I hate visiting doctors but after a week of a lot of rest, I'm going to give my family doctor a try tomorrow. Hopefully, I'll have more treats to share with my blog readers (and of course my poor wife, patiently surviving on simple meals) soon! 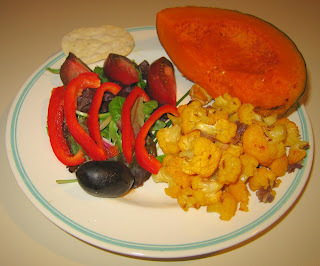 Today, my wife and I loved a dish that I came up with that was really fairly easy to make. I simply sauteed small chunks of polenta, red onion, Field Roast Grain Meat Company apple-sage artisanal vegan sausage, adding a little bit of rosemary shortly before serving. I put a tablespoon of homemade pesto sauce on top. I also quickly cooked in a little bit of oil some halved Brussels Sprouts. There is a new local company, I believe in Hillsborough, NC, called The Accidental Baker, and I found at Weaver Street Market that they have their enticing flatbreads. I purchased their garlic-rosemary, which I served with the meal - it was good, nice and crispy, but actually a bit bitter I think due to there being perhaps a bit too much rosemary. I'm anxious to try their plain garlic flavor. By the way, I also discovered at the coop these neat traditional Greek cookies, all vegan and using olive oil, from a company named Sitian Mill using traditional recipes from the Kalabokis family. I purchased their walnut cookies; they were quite good, and not too sweet. I look forward to trying the other cookies in this line! Yesterday, we went out to downtown Raleigh for the 3rd annual Neuse River Riverkeeper film festival with a variety of films related to water; we stopped for a brief dinner at Whole Foods enroute. On Friday, I had a meeting much of the day for the infant bereavement photography group that I volunteer with, and we went contra dancing in the evening. I heated half of the extra pizza left from Lilly's Pizza (with Veganrella vegan cheese) from last weekend, and Sangeeta heated some leftovers for herself. On Thursday night after my photography class, we introduced a student, her boyfriend, and a friend of ours to Sage Cafe; everybody took my high praise for their signature pomegranate reduction with tempeh dish, and that's what we all got! While I was exercising in the late afternoon, I was getting hungry and remembering that meal that I prepared a few Saturdays ago with the Spanish Saffron Trenette (linguine) that a friend sent from Seattle from Pappardelle’s. So tonight I finished off my supply and will have to ask for more! I gently brought to a simmer some Rising Moon Organics garlic-basil tomato sauce, along with about a quarter package of finely diced tempeh and a little bit (maybe a sixth or less) of red onion, chopped into 1/4" or so pieces. I let it simmer on low heat while I prepared the rest of the dishes. I cooked the lovely pasta in gently boiling water. (By the way, I saw an interesting transparent thermal vertical container a day or two ago at JC Penney's store; it was a pasta cooker and the claim was that it made excellent pasta just by pouring boiling water in, covering it, then straining it when done. Pasta should be cooked with a low boil, but I didn't realize that turning the heat off could work well, too. I wonder if I should try this new kitchen accessory!) I also cooked some green beans in the Tuscan style, gently sauteeing just for a few minutes (in walnut oil which I need to use up, not olive oil), then mixing in with fresh lemon juice, salt, and pepper. I also served my wife and I each an original flavor of Spanish artisinal Valencianos E.V. Olive Oil Cracker. I have purchased these (but I think with sunflower seeds?) before; the website describes them as "artisinal crackers from Valencia made BY HAND in three delicious flavors. Pere, his wife and another two women hand fashion these elongated 'saladitos' as they are known in Valencia. Light, crunch, irresistible." It was good. Dinner was nice! I liked the trenette with pesto that I had prepared last time even more - I have to keep on trying new things with this winning line of Pappardelle’s pastas! Tomorrow I teach (both in the morning and evening). We'll be eating out probably in Carrboro or Chapel Hill (NC), along with a friend and any students who want to join us. My wife is from the large central Indian state of Maharashtra. A staple in the cuisine is an unleavened flat wheat bread called poli. A version stuffed with jaggery (unrefined sugar; also called gul) and ground sesame seeds (til) is especially made at one of the few annual Indian solar (as opposed to lunar) holidays, Makar Sankranti, which is celebrated either on the 14th or 15th of January. Traditionally, people wish each other Tilgul ghya goad bola ("Enjoy gulachi poli and speak sweetly") to encourage good relationships. My wife rarely cooks, but wanted to try making gulachi poli. 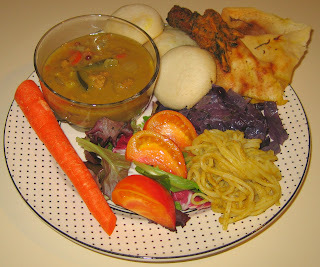 She called a favorite aunt in India and got her recipe, which I'm copying below (I also found a good description on the Food-n-More blog). She made a batch of polis yesterday and I said that I would make something that likely would go with this bread. She told me that the gulachi poli is traditionally eaten with a lot of ghee put on top; rather that substitute Earth Balance vegan margarine, she wanted to try almond butter. I warmed the polis with a little bit of Earth Balance on a cast iron pan and served us each two of them, with about a tablespoon of almond butter on the upper poli of each plate. I thought that the poli was pretty good and not too sweet. I treated it as a dessert and didn't use it to scoop up the main courses. She actually thought of her poli as the main course! 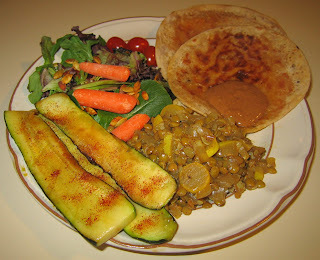 In that spirit, the "side dishes" that I made included a green lentil dish and grilled zucchini (I simply lightly browned thin zucchini slices in a little Mongolian Fire Oil, then served with a little paprika sprinkled atop). For the lentils, I put a little walnut oil in a pan for a very quick saute of about a half medium onion, diced into approximately 1/4" cubes. A minute or so into the saute, I added yellow crookneck squash, cut into approximately 1/2" pieces; in another minute or so, I added about 1/2 teaspoon of cumin seeds, continued stirring for half a minute or so, then added green lentils and water in a 1:3 ratio (I used about half of a small 6 ounce vegan yogurt container and one and a half containers of water). I added a little salt, turmeric, and red chile powder, and brought to a boil, then simmered, covered, for about 30-40 minutes till the lentils were softened. Yesterday, we went to the monthly film of the local The Cinema, Inc. group. They showed a very sweet French documentary film from 2002 about a dedicated and loving teacher teaching in a one-room schoolhouse in a French agricultural village, Être et avoir (To Be and To Have). We ate out at Lilly's Pizza, just down the street from the film. 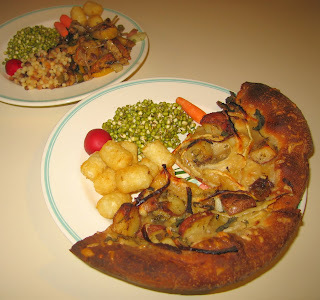 We shared a salad, a rather unique small pizza (no sauce but truffle oil instead, with roasted potatoes, fresh basil, and artichoke hearts as toppings), and a stromboli. The food was very steaming hot and good. 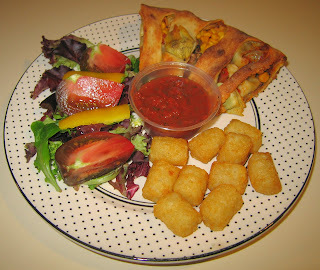 We brought home leftover stromboli, so blog readers will see it in the coming days. You'll also see a version of the pizza; they goofed as we asked for no cheese (my wife doesn't even like vegan soy cheese), but they put on VeganRella, so offered it to me to bring home for no charge and made us a new pizza. In this way, make all of the rotis. Let them cool, uncovered. They last in a covered dish, unrefrigerated, for about a week. Serve hot or cold with a dollop of Earth Balance margarine or almond butter. We were running low on groceries and it was getting late. Taking advantage of the fact that my parents are about 1/8 mile away, we got some salad ingredients and hot green pepper, and I came up with a good meal. I sauteed some most of a package of tempeh, cut into matchsticks about 1/4" by 1" till the tempeh started turning brown, then I added half of a red and half of a yellow onion, cut into thick half half-moons. I subsequently added to the saute some bell pepper, okra, and finally rice noodles that I had soaked then drained. 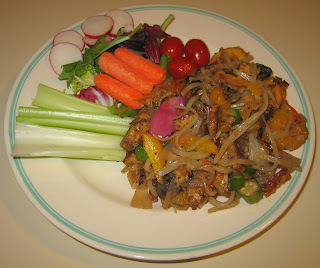 I let the rice noodles be stir fried for a minute or two, adding as well about a tablespoon of diced ginger. 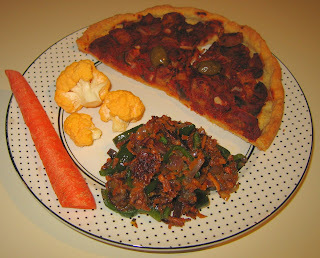 I would also have added the hot pepper at this time, but my wife hadn't returned with our supplies yet :-) . Then I added a half can of reduced fat coconut milk and simmered, adding half of the pepper, sliced, when my wife returned. I heard in the autumn that one thing that characterizes good Mexican food (I know, this was a Thai dish, but I thought I'd try the hint) is to use three different kinds of hot pepper in a given dish; in addition to the green pepper, I sprinkled in some red chile powder and several splashes of Mongolian Fire Oil drops. After concluding with a little bit of salt, I served dinner - we both loved it! This past June, I prepared Fregola Sarda (Sardinian Couscous) with Pesto; we liked it but thought that it should have a more pronounced sauce. 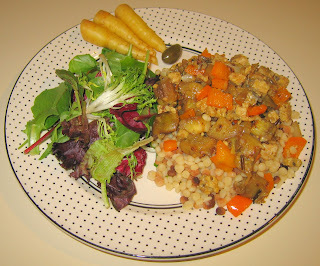 I had the dried fregola sarda (pasta abruzzese di semola di grana duro), or Sardinian couscous, left from then. As I described, it is "durum wheat toasted pasta that is made by rubbing (fregare means 'to rub' in Italian) coarse semolina pasta and water together to make large granules which are then toasted". I forgot to mention that just recently I found a local source, A Southern Season gourmet store, for the Chile sauce that I came to enjoy in New Mexico on our October vacation - in fact, the very 505 Southwestern brand, and even the same 2-ounce single serve packets "Flame Roasted Green Chile Singles". I have a few packets left from New Mexico, so used one in today's meal. I cut a small eggplant into cubes maybe 1/2" in size and started sauteeing them in a saucepan. Of course, eggplant sops up oil, so I had to add a little bit more oil as it cooked. As the eggplant started becoming a bit clear in color, I added in a medium shallot, finely diced. A few minutes later, I added about a quarter of an orange bell pepper, roughly diced to 1/2" or so in size. Finally, I added a chile sauce packet, let it all get mixed together and cook just a minute or two more, then added a little salt. I served it atop the fregola sarda that had been cooked in boiling water. It was good! There was just enough "oomph" to make it quite tasty and interesting. I have a little leftover couscous, perhaps for a simple side dish in a few days, and enough dry, uncooked product, to make a small serving in the future. I probably will purchase more at some point. Yesterday, I had two new classes that started, a morning computer class at DeVry and then an evening photography class at the Carrboro ArtsCenter. After photography, my wife met me and I enjoyed what I think is our area's best pizza, a vegan pesto pizza (I had artichoke hearts and tomatoes also on top) from Panzanella; she had a good pasta dish there. The weather has been surprisingly warm the last few days, warm enough, even reaching in to the 70s (°s F), to bicycle in shorts and t-shirt! I couldn't resist using the grill today. I have only grilled a few times before, this past August and then shortly later in early September. I grilled kabobs similarly to what I did in August, with about half a dozen Austrian fingerling potatoes, half of a medium-large red onion, and a full container of seitan. I marinated these ingredients, as well as asparagus, in Floribbean Foods' Key Lime Savory Oil, for about a half hour. I let the kabobs cook for about a half hour before flipping them over and adding asparagus spears. I'm delighted that the food editor of our local Independent newspaper is running a story on vegetarian restaurants and had set up a phone interview with me (I'll add a link when the story runs in early February), so I took her call then. I wanted to let the grilling go on for another 20 minutes, but the call took a little longer, and the grilling went on another 40 minutes. The time was about right for the potatoes and not bad for the onions; the seitan was still good, but I would have liked it to be a little less tough. So, I might recommend grilling potatoes (even cut in half like I did) separately for about 60-70 minutes, flipping and basting approximately halfway, and seitan and onion for about 45-50 minutes, again flipping and basting halfway. To reduce heat loss, it would be best to simply get the potatoes cooking at time T, put in the other ingredients on their own skewers at T+20 minutes, flipping and basting it all at T+40 minutes, and serving at T+60 or T+70 minutes. Dinner was good. 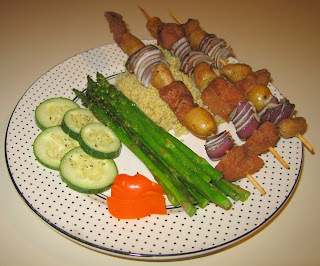 We had the kabobs with quinoa, along with the asparagus. 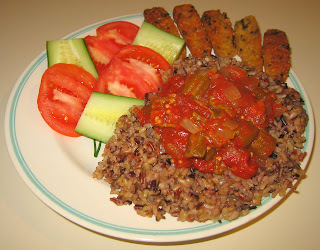 I served this atop rice that I had cooked with a cube of vegan bouillon, as well as tempeh sauteed in the Key Lime oil. It was just an idea that I had and it came out pretty good, but I'd like to try making something more akin to Louisiana gumbo. Though the oil did well with the tempeh, the lemon flavor just didn't blend well with my dish; I'd omit it and maybe the sweet cider, as well. I liked the consistency, so I might go with 2T olive oil and 7T water. I would also add a little more salt and add some "heat" such as red chile powder or hot peppers. Tonight, my wife had Sanskrit class and I had to go in to DeVry where I am teaching a new computer science class starting this Thursday. She said she would eat some leftovers when she came home, and I made a simple meal for myself before I went to campus. I had a packet of Road's End Organics "Chreese" (no shells, just the powdered base, including nutritional yeast, that I mixed in to hot hemp milk - a new idea for me that came out great - to make the sauce), and made "chreese" sauce, adding it, along with diced red onion and red and orange bell pepper, to organic brown rice pasta (finishing up penne and mixing in some elbow as well) by Tinkyada (ricepasta.com) . I also added some salt, black pepper, and a little dried parsley. 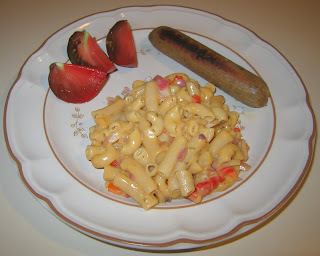 Dinner was made complete with some tomato and Field Roast Grain Meat Company apple-sage artisanal vegan sausage. A big hurrah to my friend Eleni of Binge Cafe, who was one of my original inspirations to start blogging almost two years ago, for the release of her documentary about veganism, Seeing Through the Fence. My wife and I attended the film's premiere last night - it was sold out beyond the capacity of 100 (they had good press). They had great food provided by local Chef Shirle of Rockin' the Stove (it goes to 11), including seitan sticks, quinoa & black-eyed pea croquettes, spanakopita, and a variety of sweets. It was a hopping event and the film generated a lot of good questions. When we came home, we just had a light bite at home. As I mentioned in the middle of December, a good friend sent me some fine artisinal Pappardelle’s pasta; we enjoyed the lime cilantro linguine and today just loved the Spanish saffron trenette (linguine). She told me to let her know if she should send more - I definitely want more! The pasta tastes freshly made and has a richness of flavor. 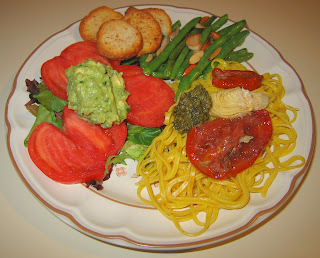 I sampled a little bit of the pasta once it was cooked and was surprised how nicely the saffron flavor came through - and how the deep yellow color persisted. I decided to serve it simply, with a few pieces of roasted tomatoes marinated in herbs and oil, as well as marinated artichoke heart and a small dollop of homemade pesto sauce. 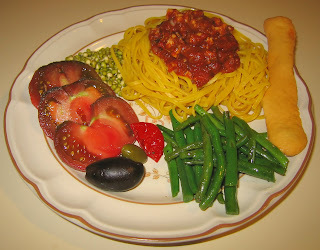 I also made green beans similarly to how we had them last year in Toscano. In my cast iron pan over medium heat, I cooked the beans, along with two cloves of marinated garlic, in walnut oil just for a few minutes till the beans turned a deeper green. At that point, I tossed in about a dozen almonds that I had split in half and cooked just another minute or so. I mixed in salt, black pepper, and (once in the serving plate; I didn't want to add the acidic lemon to the cast iron pan) a few drops of fresh lemon juice. I had never had beans with big chunks of almonds, though of course I've had almondines; the dish was still simple but good. I recently found Nonni's brand "panetini", small toasted bread ideal for bruschetta. We commonly found these small breads in Italia during our visit last October. I served these "panetini"s as well as some guacamole that I had purchased. We both loved the meal! I took a bunch of red kale and just sliced it every inch of length, going up and down the stalk. Then, in a large stock pan, I put a little olive oil and three cloves of garlic that I had thinly sliced, and sauteed over medium heat for just a minute or so - I didn't let the garlic turn brown but just soften a bit. 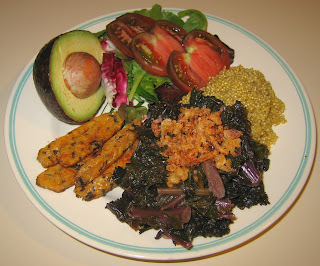 I added in 1/2 cup boiling water, into which I had dissolved a cube of vegan bouillon, the kale, and a little salt. I brought the heat up to return the water to a boil, then reduced it to a low heat and simmered the kale, covered, for 6-8 minutes. Removing the cover, I let the kale cook for another 5-7 minutes till much of the water had evaporated, then I mixed in some freshly ground black pepper, a tablespoon or so of red wine vinegar, and maybe 1/2 teaspoon of fresh ginger, finely diced. 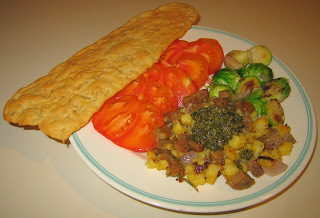 I served it with some gourmet fried Lars' Own brand crispy onions on top, along with quinoa and sauteed tempeh. Tonight, I made one simple side-dish, Thai rice noodles with prepared green curry paste mixed in, and served it with leftovers from the past few days, including idlis and dosa from my birthday outing. My wife found it to be too much food! I put too much curry paste in the noodles; I wanted to finish up what I had left and put in more than a tablespoon. She was right; in fact, she remarked that the noodles were the first dish of mine that she has ever had in almost four years that she didn't like. Happy New Year! May 2008 be a good year for all, with more positives than negatives. My wife has been asking about cauliflower, a vegetable I haven't cooked much with. Today, I picked up a head of a neat yellow variety (Brassica x oleracea L. 'Cheddar' ?) and made a simple dish that came out, we both felt, excellent. I simply cut off most of the florets, reserving a very few for eating raw in the coming days. I tossed with a tablespoon or two of olive oil, a little salt, and one medium red Italian cipollini onion, then spread the cauliflower into a single layer on a baking sheet and baked in a preheated 375°F oven for just over a half hour. I had put a teaspoon and a half or so of cumin seeds in a dry pan and quickly heated, for about a minute and a half while frequently tossing, the seeds over medium heat; I mixed them in to the finished cauliflower. The dish turned out amazingly flavorful and pleasingly soft. I also baked an organic buttercup squash for about 40 minutes. Not shown, we also had a little lemon-rosemary sourdough bread with hummus. It was a good dinner! As I had guessed in my last post on Friday the 28th, I didn't prepare any further dinners till tonight. On the 29th, I helped a fellow photographer with several photo sessions of his clients and my wife helped with child care for their adorable 5-year-old. They all kindly made a nice dinner for us of a variety of items, including shredded squash with oil, vinegar, and seasonings I believe; raw vegetables; grilled vegetables; two kinds of rice; and more. My wife arranged a nice surprise for my birthday at a nice nearby Indian restaurant, Sitar. They had nice dosas, cut into quarters or so, as well as idlis, sambar, and pakoras. Then they brought out rice and two vegetable dishes for main courses, as well as a semolina dessert and vegan chocolate cake from Weaver Street Market. So that my parents could also enjoy, all the food was not only vegan, but also free of onion or garlic - and tasted great! It amazes me how little publicity plant-based diets get for being probably the best way to go for the environment and our health, nevermind treatment of animals. After dinner, I got a chance to see the newly released 1-hour documentary DVD that the Jewish Vegetarians of North America have released called A Sacred Duty: Applying Jewish Values To Help Heal The World (you can request your own free copy). It is a well-made film with many environmental and Judaic experts interviewed. We already have scheduled for later this year a Triangle vegetarian society event on Judaism and vegetarianism; I will see if I, possibly with help from Jewish members of the group, can help get the word out and make this a resource available to area Jewish synagogues.